The government media are trying to paint the announced resignation of Msgr. Kiet, for health reasons, as a government victory, presenting itself as the absolute arbiter of religious life in the country, who even the Pope must obey. Hanoi (AsiaNews) – A press campaign is underway to represent the upcoming resignation of the Archbishop of Hanoi, Joseph Ngo Quang Kiet as a victory for the Vietnamese government and convince Catholics that any decision on religious life in the country depends on Communist Party. Even the Pope, in this context, must seek its approval. Regarding Msgr. Kiet yesterday, the archdiocese said that the bishop has left Hanoi to resume the treatment started already in March - first in Rome and later in Paris - after two months spent at the monastery of Chau Son for the same reasons. He is suffering from chronic insomnia and stress, a condition attributable to the attacks mounted against him by the authorities. For almost two years, he has been unable to sleep. Mgr. Kiet, in a recent interview said that because of his health, he had asked the Holy See to be allowed resign. But neither the Holy See or the Bishops' Conference had accepted the request. Archbishop Kiet has reiterated several times that even during the most difficult moments of his relationship with the government, "the Holy See and the Episcopal Conference were always by my side". Here are the facts on the matter. On May 8, in Hanoi and Ho Chi Minh City, the government press campaign got underway, reporting on the installation ceremony of the new coadjutor bishop, Nguyen Van Nhon, underlined a sentence in the official VNA agency, that "once approved by the Prime Minister" the Pope had proceeded with the appointment. The phrase, repeated in all news reports, appears aimed at convincing Catholics that all religious activities in the country need the "approval of the Prime Minister." In these days, then, state media have claimed that the resignation of Mgr. Kiet will take place between May 13 and 18. 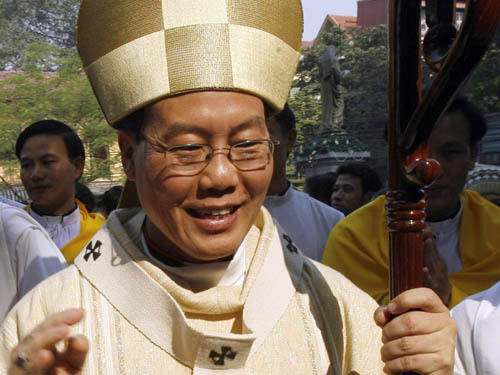 They have received instructions to portray the withdrawal as a victory for the government over the archbishop, who also succeeded in forcing the Vatican to accept a "road map", which raises the retirement of the archbishop of Hanoi as a condition for the establishment of diplomatic relations and a possible visit of Pope According to these journalists, local government authorities are preparing a party to celebrate the "victory". The wide coverage of these events is creating discomfort and doubts among Vietnamese Catholics. The government campaign, in short, is spreading the belief among the faithful that the Holy See is willing to sacrifice a bishop, loved by the Catholics and hated authorities to achieve its “diplomatic” objectives. The Dominican, Nguyen Xuan Que, writes "Vietnamese Catholics have lost a lot of confidence in the politics of Vatican Diplomacy and the Conference of Bishops. They do not believe in the path, and are convinced that the Vatican does not understand the Vietnamese Church and does not know the actual reality of this Church”. "The Vatican knows nothing of today's Vietnam," echoes a missionary who has lived in Vietnam for many years. This belief is strengthened by those who fear that a new era - seen as negative – is being born in the relations between the Vatican and the Vietnamese government, fuelled by rumours that together with the resignation of Mgr. Kiet, the resignation of the Bishop of Vinh, Paul Mary Cao Dinh Thuyen, will also be announced. Both have a history of determined resistance and opposition to any attempt by authorities to restrict religious freedom or misappropriation of church property.